The dramatic cliff top setting overlooking the Bay of Naples makes Sorrento one of the most memorable holiday destinations in Italy. ‘La Dolce Vita’ was a term made famous by the film, however this saying was used long before and perfectly personifies how Italians view life; ‘indulgent, full of pleasures and meant to be enjoyed’. Sorrento offers something for everyone. From fascinating museums and characterful markets to the scenic cliff top towns lining the coast. You can even spend the day admiring the views whilst relaxing by the pool. Having so many things to do in Sorrento can be overwhelming so I have created the ultimate guide to one of Italy’s most famed and picturesque destinations. When going out to eat in Sorrento there is no doubt you will be thinking about the local delicacies. The tomatoes are heaven, the lemons are succulent and the fish is so fresh you can still taste the sea. It is easy to eat like a local in Sorrento as food is part of the national identity, therefore you will find yourself eating alongside joyful Italians and tourists alike. The heart and soul of Sorrento is Piazza Tasso. You will find many restaurants here and on the small side streets leading off from it. At night time, the entire square comes alive with people enjoying the mild evenings. If you want to venture out a bit further you can also head to the slightly quieter Piazza Sant’Antonino. If its seafood you’re after then head down to the picturesque Marina Grande. This small sandy stretch of beach is lined with understated family run restaurants serving up fresh fish and local cuisine. The colourful fishing boats that bring in the days catch line the waterfront and the beautiful pastel coloured houses keep Marina Grande in a traditional time warp. For couples seeking a romantic break, there is no better place than Sorrento. Its views over the Bay of Naples and Vesuvius, the sunsets, the laid-back atmosphere; all the elements make it a perfect place for a honeymoon or couples celebrating a special occasion. Some people might agree that watching the sunset whilst on holiday is a very cliché thing to do. However, you cannot deny that they are simply spectacular in Sorrento. 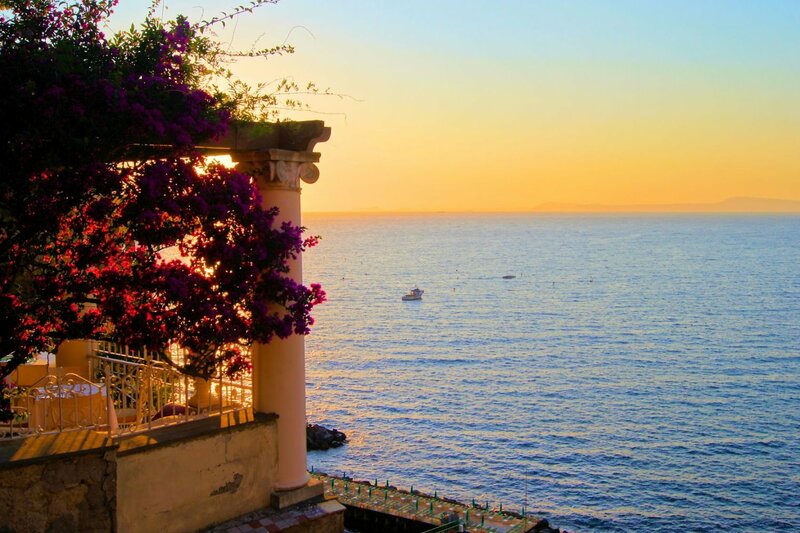 Sorrento’s sunsets are the perfect way to wrap up a day exploring with a cocktail or two on a swanky hotel terrace. One of the most famous and iconic hotels in town is the Grand Hotel Excelsior Vittoria. The hotel’s terrace which overlooks the sea will leave you breathless (non-hotel guests are welcome). 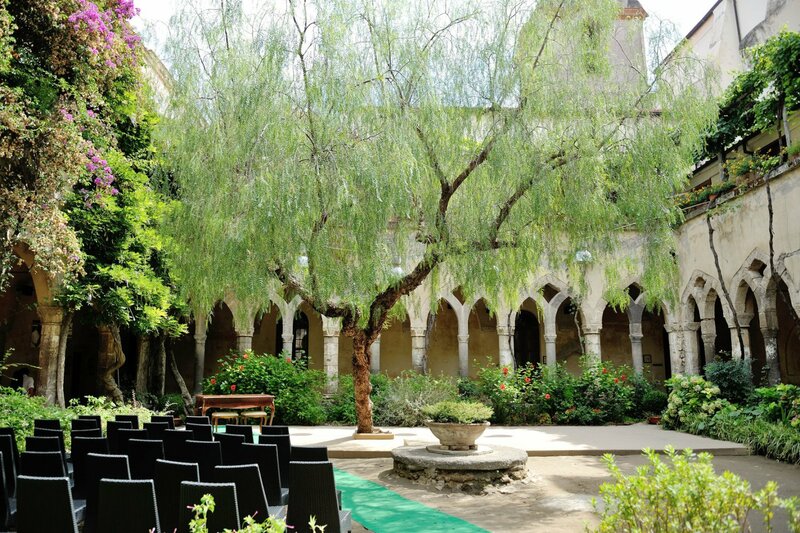 There is a reason why so many weddings take place at The Cloisters of San Francisco. It is by far one of the most romantic and magical places to visit in Sorrento. This tranquil and beautiful setting is just a stone’s throw away from the busy and vibrant centre but offers a calm fairy-tale like atmosphere. The beautiful arches that circle the garden area are draped in greenery creating a quiet and calm feeling as soon as you step inside. During the summer, the Cloister is used for art exhibitions and concerts making it come alive. Sorrento might not be famed for its beaches; however, you do not have to travel far to reach some truly beautiful ones dotted along its peninsula. 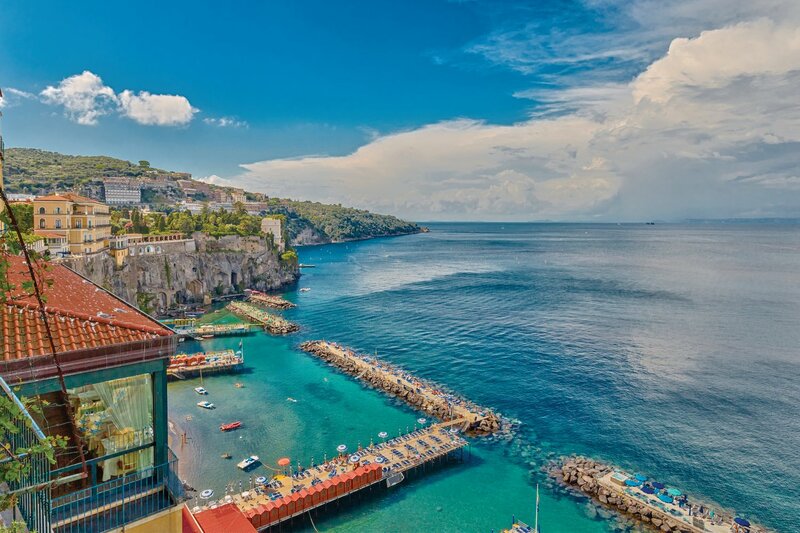 During the high season and weekends the beaches near Sorrento can get busy with tourists and locals escaping the intense heat of the towns and cities. A tip is to head down early to get a good spot before all the loungers and umbrellas go. This is the closest beach you will find to Sorrento, located not far from its historic centre. It’s perfect if you don’t want to spend a long time travelling to a beach, however being small it can get crowded. It’s made up of beach clubs where you can purchase loungers and umbrellas. Located just 2 kilometres from Sorrento this small beach with crystal clear waters is idyllic. It is just by Marina di Puolo where you can find a handful of restaurants to have a bite to eat before heading to the beach. The beach is made up of two sectors, the free public beach (loungers and umbrellas at a cost), or the beach club (entrance fees apply). Although situated some distance away from Sorrento it’s well worth making the journey to Positano to enjoy the most famous and recognizable beach on the Amalfi Coast, Spiaggia Grande. The beach is long and you have the option to hire a lounger and umbrella or bring a towel and use the free beach. For a completely unique experience try the authentic and harder to reach Laurito Beach which is in a secluded bay along from the main beach in Positano. This is mostly accessed by small shuttle boat and well worth the journey. Sorrento is one of the best places to stay in Campania if you plan on booking up some excursions whilst on holiday. Numerous group tours leave from the centre of Sorrento with many to choose from including full and half day tours. Below are some of the most popular and unmissable excursions from Sorrento. 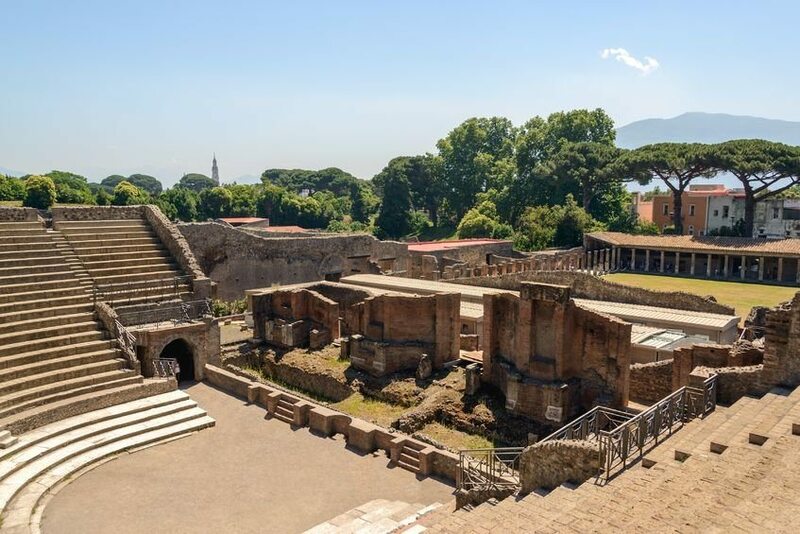 No trip to Sorrento would be complete without an excursion to the renowned Pompeii and Herculaneum. 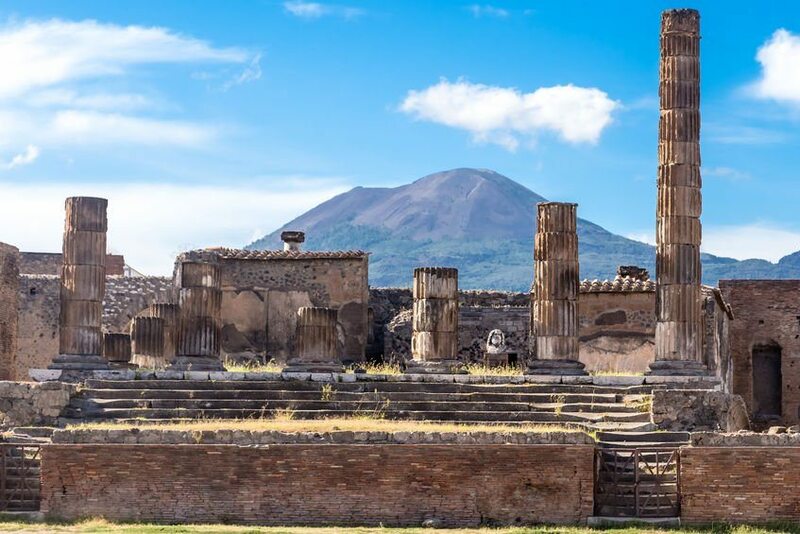 These archaeological sites are living proof of the powers of Mount Vesuvius which wiped out both towns’ population with its violent eruption in 79 AD. They have been UNESCO World Heritage Sites since 1997 and have had tourists gathering to see these preserved Roman towns. Pompeii and Herculaneum full day group tour departs Sundays from Sorrento starting at £60 per person excluding lunch and entrance fees. For many, Mount Vesuvius is considered the ultimate reason to visit Sorrento. You may be able to see Mount Vesuvius from Sorrento but taking a visit to Vesuvio National Park to walk its summit is a rewarding experience. Once you reach the summit you can see inside the crater of this magnificent active volcano. Mount Vesuvius half day group tour departs on Mondays from Sorrento starting at £40 per person excluding lunch and entrance fees. 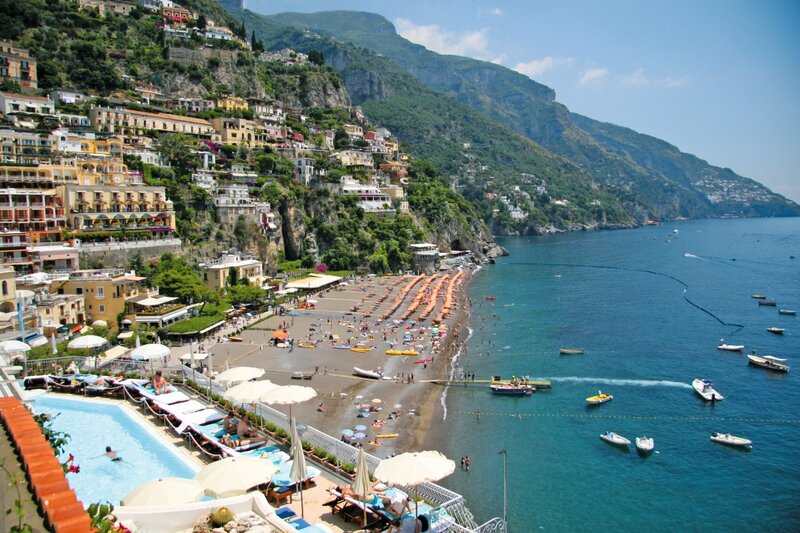 If you are planning a trip to Sorrento then an Amalfi excursion is a must. 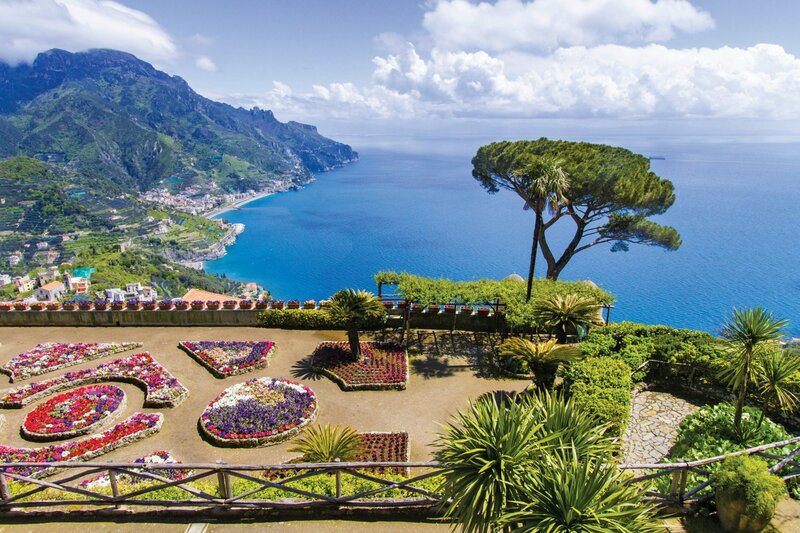 The dramatic cliff edges of Amalfi overlook the glistening Tyrrenian Sea creating a jaw dropping coastal drive. This is where you will find some of Italy’s most exclusive areas. Head to Positano, Praiano, Amalfi and the mountain high Ravello to visit picturesque villages that have views to take your breath away. Amalifi drive full day group tour departs most days from Sorrento starting at £50 per person excluding lunch and any entrance fees. Whilst in Sorrento you may want to take a boat trip to one of the islands off the coast. Capri is high profile sophisticated and exclusive. It’s a holiday destination for the rich and famous however it’s just as popular with day trippers. The port fills up every morning as the boats come into Capri harbour and the piazzas fill up with people. Capri’s Grotta Azzurra (Blue Grotto) is the island’s main attraction. Sunlight peers through the cave illuminating the sea water in a translucent blue. Ischia is the larger of the islands with a handful of traditional and unique towns dotted along its north and south coast. In recent years, it has been put on the map as the top filming location of ‘The Talented Mr Ripley’. Its beautiful cobbled streets and laid-back atmosphere make it perfect for a day trip. 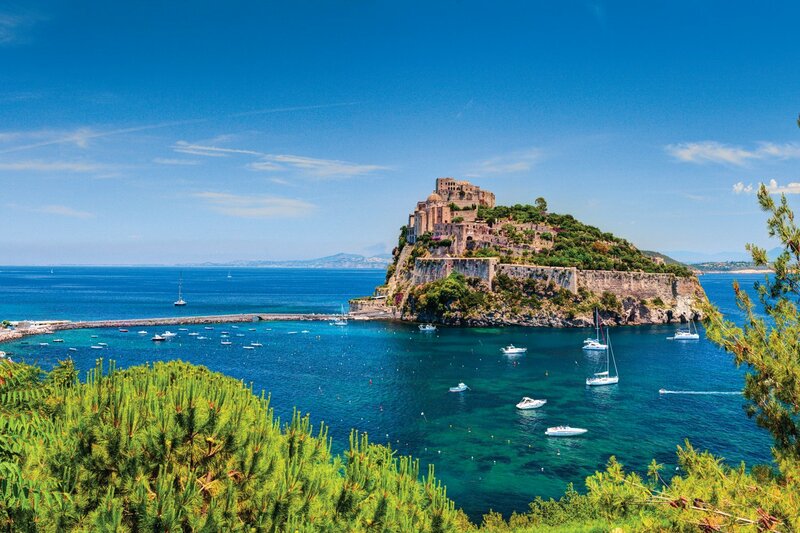 Take a walk from Ischia Port to Ischia Ponte to see the beautiful Aragonese Castle or visit the enchanted La Mortella Gardens which overlook the Bay of Forio. 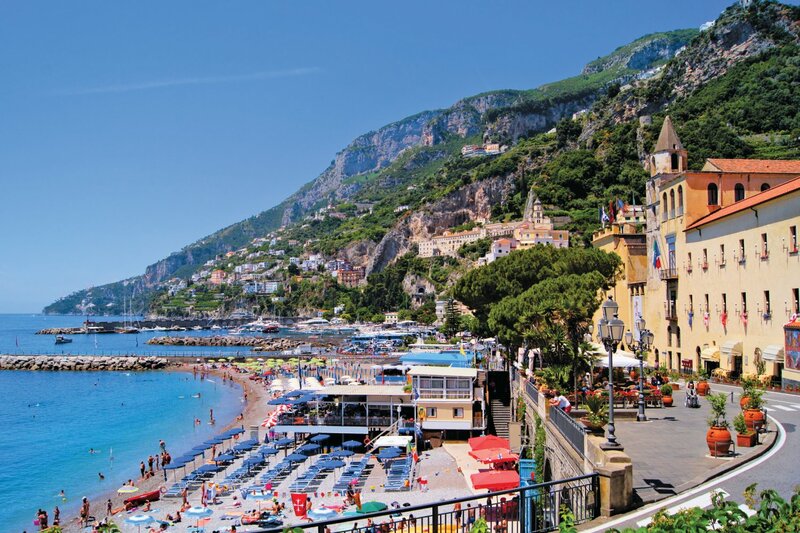 Capri by boat group tour departs most days from Sorrento starting at £115 per person. Ischia with the La Mortella Gardens group tour from Sorrento starts at £95 per person. Both exclude lunch and entrance fees. Even though Sorrento has one of the longest seasons in the Mediterranean sometimes the weather can surprise us all and take a gloomy turn. It is vital to have a small list of things to do just in case it rains and you want to stay dry. This beautiful museum is a labyrinth filled with artwork, furniture and chinaware both native and international. The museum spreads out over three floors with 24 separate rooms and a magnificent garden overlooking The Bay of Naples. The villa was donated to the city by the last family descendants, Alfredo and Pompeo Correale and is a magical place to visit and worth seeing even if it is not raining. 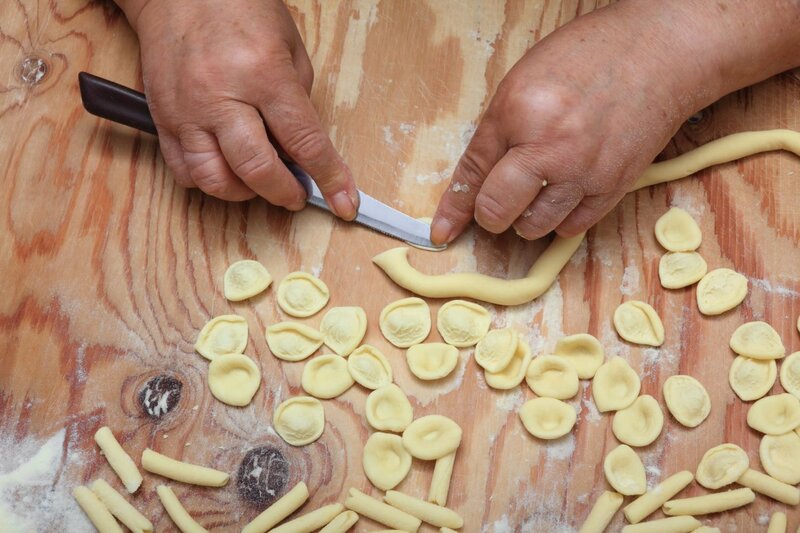 There could be nothing more appropriate whilst away in Italy than taking a cooking lesson. As food is such a big part of the culture there is no shortage of authentic family run eateries and places that run cooking classes. No matter what your abilities may be, if you have a passion for food you can enjoy one of these classes that operate around Sorrento. With Sorrento being so close to the sea the food is heavily seafood and vegetable based. Sorrento may not be known for having a lengthy list of free things at hand for tourists to do. However, there are a few things that do not cost much or anything at all that will expose the beauty of the city. Passeggiata is Italian for ‘gentle stroll’. This activity perfectly sums up the Italian way of life and is mostly done once the sun goes down and the warm dusky summer evening arrives. The best place to do this is either in the central town square or along the beach. The Italians take this activity very seriously and often you will see entire families taking a passeggiata before or after dinner. For a small additional cost it is also popular to incorporate an aperitif or a gelato. Sorrento like all of Italy, has places of worship in ample amount. Extravagant and grand they are well maintained and host a vast amount of dedication to keep them pristine. If you wander around you will soon find small and stunning places of worship. 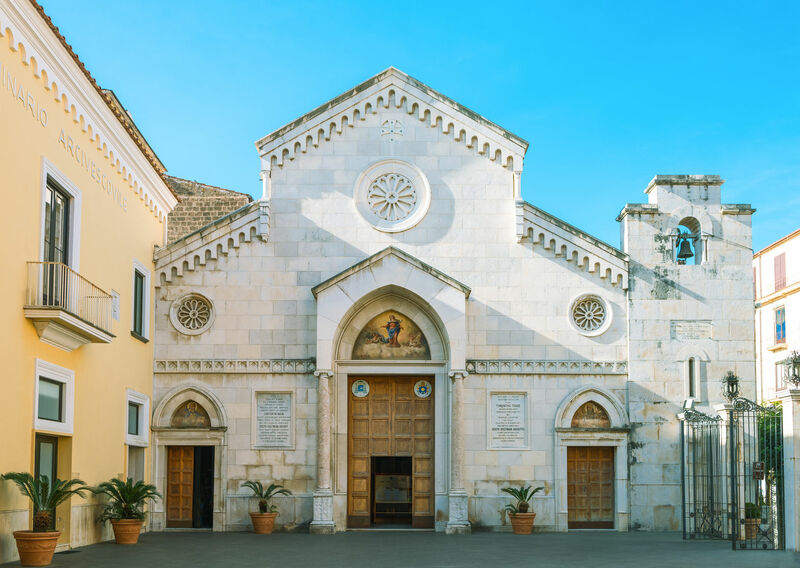 One of the most magnificent and notable in Sorrento is Basilica Di Sant’Antonino. Named after Sorrento’s Patron Saint it is home to his tomb and truly an exquisite structure. The Cathedral Di Sorrento is located just off Corso Italia and worth a visit to see its magnificent interior. Remember to dress considerately and give a small donation if you light a candle. 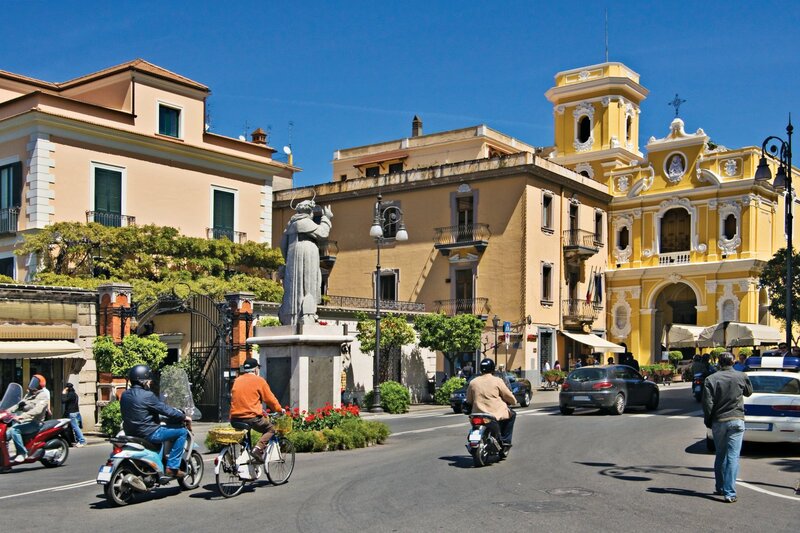 If it’s shopping you want to do, you can find it all in Sorrento. From high end boutiques to small quaint shops selling local products, you will be sure to find many unique items to take home. The main area to browse and buy is Piazza Tasso and the small side streets off it. Many shops in Sorrento will open in the morning and close for a long lunch, before opening again around 5pm once the sun has lost its intense strength. 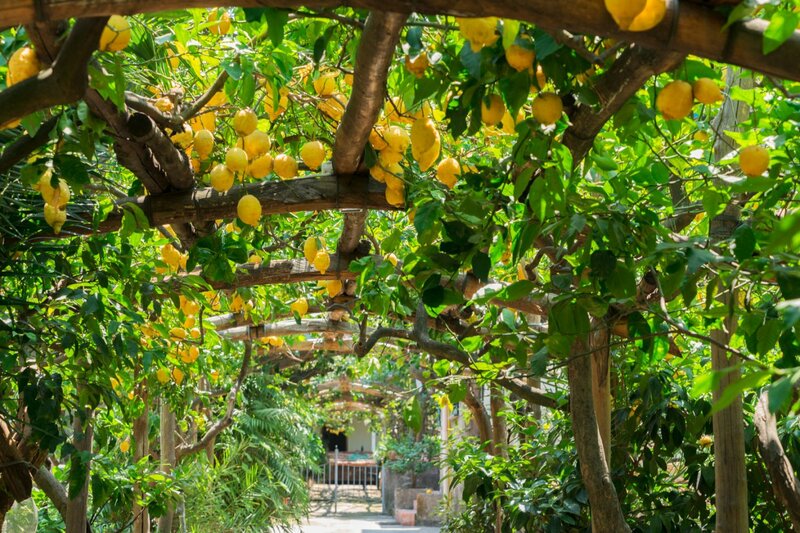 The lemons that grow in Campania are famous the world over, so it’s no surprise you can buy limoncello in excessive amounts in Sorrento. Many shops sell it in all shapes and sizes for tourists to put in their luggage or to sip on their balcony whilst admiring the view. You can also buy limoncello flavoured goodies such as cookies and sweets. In Sorrento you will find many traditional shops selling hand crafted leather goods such as wallets, bags and sandals. Many of these workshops have been family run for numerous years and offer tourists authentic one-off goods. 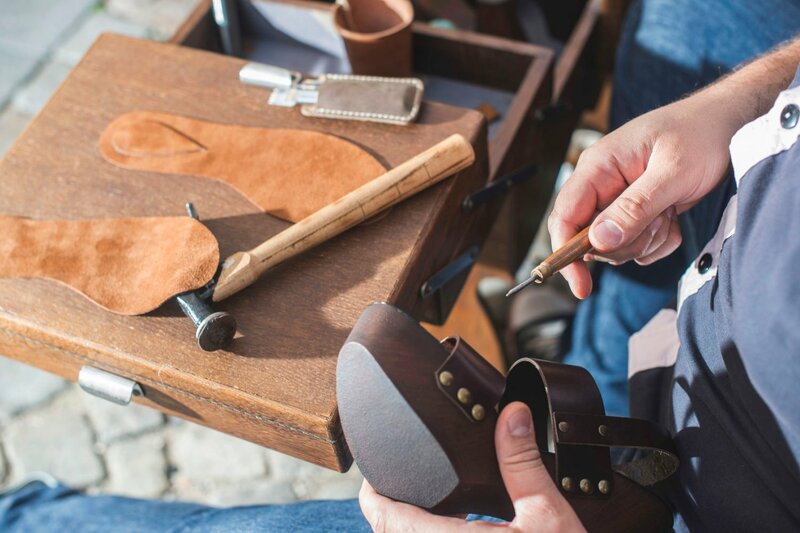 For the ultimate in unique souvenirs, you can get your very own leather sandals handmade to your own taste, height and colour. You cannot get more Italian chic than that. 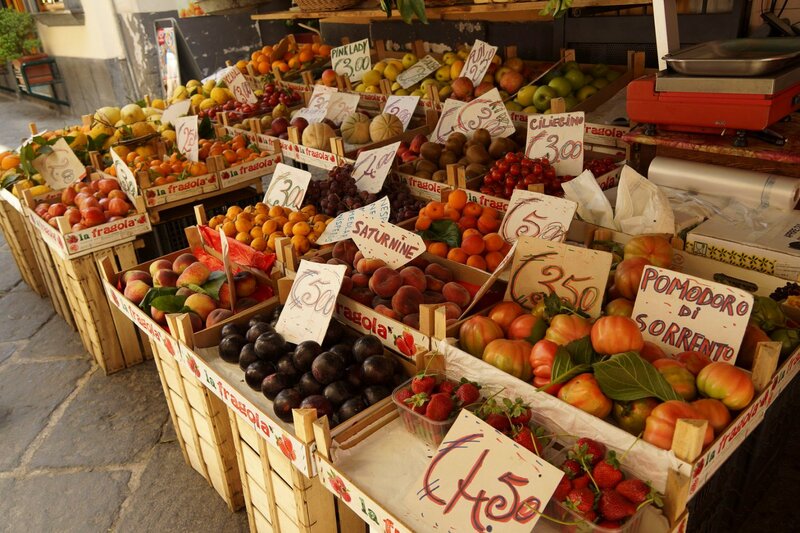 Do not forget to visit Sorrento’s market which operates every Tuesday. It’s a fantastic way to mingle with the locals going about their daily life. This colourful and vibrant scene starts early in the morning selling food, clothes and household items. This is a superb place to get some bargains. Have any questions about Sorrento? Get in touch in the comments below or call our Italy specialists on freephone 0800 294 9322. For Italian inspiration visit our website.